Are birds modern-day descendants of dinosaurs? 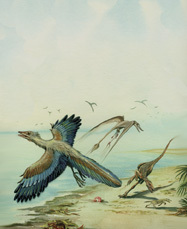 Ever since the finding of Archaeopteryx (“Archie” as we will call him) people have assumed that dinosaurs evolved into birds. But, the evidence tells us otherwise. Archie is a bird that was found in Europe. He had the wingspan of about 24 inches and has teeth and a bony tail. Today, birds do not have bony tails or teeth. But, does that prove that Archie was a transitional form? Of course not! If he isn’t part dinosaur and part bird (a new creature I call “dinobird”) what is Archie? The answer is simple: Archie is strictly a bird! Some humans have legs and some don’t. The same thing goes for any other animal. The point is: all Archie has “proven” was that some birds have teeth, bony tails and claws on their wings! Conclusion: birds are not modern day descendants of dinosaurs and that theory is completely unscientific and has no evidence or standing. But, you will find a very strong foundation for our belief in the opposite of evolutionary thinking in Genesis 1:20-25. In those verse we find that God created land animals, including dinosaurs, on day six and He created fowl of the air, including Archie, on day five! If you can’t believe the Word of God what can you believe? !